FTP transfer between the drone and host computer fails either during firmware update or during the deployment of Simulink model to the drone. The communication over Bluetooth® connection is very slow. The flight log indicates that a memory allocation error has occurred. The LEDs on the PARROT Rolling Spider minidrone do not turn green after you switch on the drone; the LEDs remain yellow even after a few seconds. Connect the PARROT minidrone to the host computer using USB. If the host computer is running on Windows, ensure that RNDIS is installed (see Install RNDIS for Parrot Minidrones). Wait for the LEDs on the drone to stabilize to either green or yellow. If the Telnet command fails, see Telnet Connection to Minidrone is Failing. After successful Telnet connection, go to /data/edu directory. Delete all the text files, MAT files, and shared object files. Disconnect the USB connection between the drone and host computer. If the Telnet connection to the minidrone is failing, first reboot the host computer and try the Telnet connection again. Ensure that the minidrone remains switched on while the Telnet connection is being established. If the Telnet connection still fails, check the platform-specific errors described here. Error: The command prompt displays the message "Connecting to 192.168.2.1......" for a long time. Action: Install RNDIS on the host computer (as described in Install RNDIS for Parrot Minidrones), and perform the setup and configuration again. 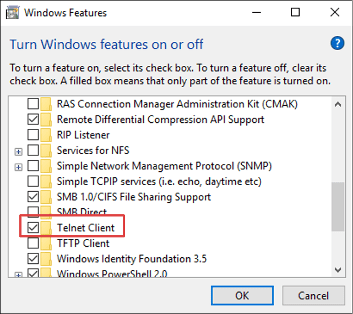 Error: The command prompt displays the message "'telnet' is not recognized as an internal or external command, operable program or batch file" . On the Search bar of Windows 10, search Turn Windows features on or off. Select Telnet Client and click OK.
Reinstall the RNDIS if you are using a different USB port than earlier to connect to the PARROT minidrone. Reinstall the Support Package on the host computer. Perform the setup and configuration activities again for PARROT minidrone. Disconnect any other USB mass-storage devices; ensure that the connection to the drone is the only USB connection from the host computer.